The DescenderPro is a ceiling recessed-projection screen that combines new installation features. One of the most noticeable new features is the possibility to just click-in the entire roller that includes the motor and screen surface after installation of the case. The new case design offers a clean finish without gaps or visible screws, after attaching the bottom plate to the case. Accessing a projection screen to make adjustments and complete maintenance has been made installer friendly by Projecta. 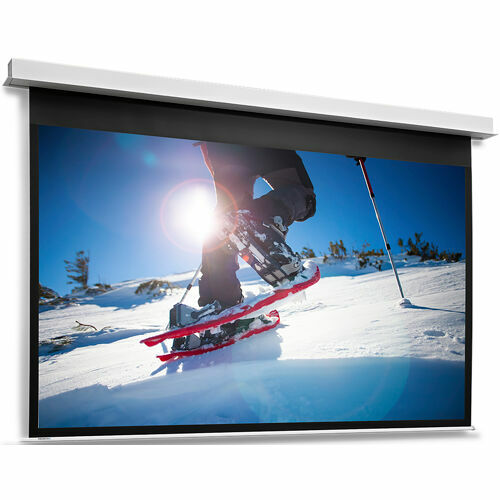 The motor and screen surface remain accessible even when the projection screen is installed in a ceiling. When the construction is finished, take the Screen Surface Assembly out of the box. The Screen Surface Assembly includes the roller, the motor and the screen surface. This assembly can be installed direct in the Screen Case in the ceiling by clicking it in place with the new easy connectors on either side.